Hey! 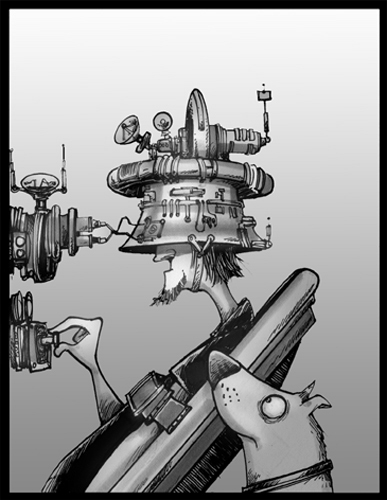 Check out the other entries for "CONTRAPTION" at Illustration Friday. Unfortunately Bobby didn't notice the dog standing right next to the transporter. On the bright side, he doesn't have to worry about spiders. Sadly, he lives in California. When found without a license, strays are neutered. After years of intensive tinkering, Brad's dog-language translation device was finally perfected. Now he knows that whenever Ginger barks, she is actually saying "Hey, hey, hey, hey, hey, hey..."
How Obama Voters are made. Thanks for the kind words. I had a lot of fun with this one. Reminds me of Wallace and Grommit. If you are not familiar with it you owe it to yoursel to watch "The Wrong Trousers". This page contains a single entry from the blog posted on October 10, 2011 6:42 PM. The previous post in this blog was Wayback Machine: January 23, 2007.